In view of the success of our “Complete guide for traveling in China“, I thought I’d write a similar guide about traveling to Hong Kong (visas, transport, hotels, etc). But then I thought of how, before arriving in Hong Kong for the first time, I didn’t even know what there was to see. So I decided to publish, first of all, an article introducing the main attractions of Hong Kong. Enjoy! P.s. The MTR (Mass Transit Railway) is Hong Kong’s subway system. Click here for an interactive map. P.p.s. Click here to read the review of the best hotels in Hong Kong. We’re not just talking about any light show: A Symphony of Lights is entered in the Guinness Book of World Records as the largest permanent light show on the planet. In fact, 45 buildings along the Skyline of Hong Kong Island “shoot” laser lights toward Victoria Harbor in time to music. The show, which had a price tag of about five million Euro, is held every day at 8 in the evening (so long as there is no typhoon warning) and lasts fourteen minutes. Statistics aside, in my opinion the show is really well done and if you come to Hong Kong, you really shouldn’t miss it. Despite the fact that the show is performed on Hong Kong, to watch it you have to go to Kowloon. In particular, Take exit J of the MTR Tsim Sha Tsui East Station (Kowloon Peninsula) and you’ll arrive at Tsim Sha Tsui Promenade, on the Avenue of Stars up to the Hong Kong Cultural Centre. Just follow the signs! Victoria Peak is the hill that forms the backdrop for the skyscrapers of Hong Kong Island (yes, the same ones that wake up at night and perform the show A Symphony of Lights). With an altitude of 554 meters above sea level, Victoria Peak represents the highest point in Hong Kong. I recommend that you arrive there just before sunset so you can admire Hong Kong as it becomes colored by lights. p.s. If you’re interested in that sort of thing, on top you’ll also find Madame Tussauds. 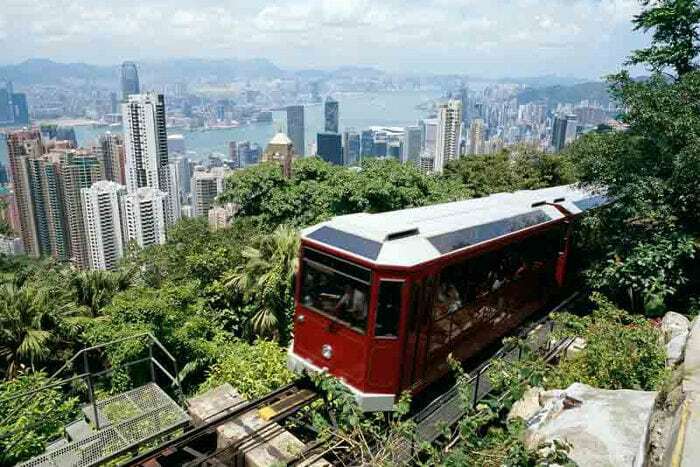 You can take the Peak Tram (which is more than 100 years old, has never had an accident and, to tell the truth, is an attraction in its own right) from the Peak Tram Lower Terminus on Garden Road (which you can reach walking from exit J2 of MTR Central Station) or by walking. Just a heads up that if you go on foot, you’ll be facing a climb of about 500 meters for a total 3.5 km of walking. If you’re interested in this second option you can visit this page for details. Central is to Hong Kong what Wall Street and the City are to New York and London. It is here, in the northeastern part of the island, that you’ll find the most spectacular skyscrapers and most luxurious shopping malls of Hong Kong. It is also here that you’ll find the oldest buildings and roads of Hong Kong, starting with Queen’s Road, the first street of Hong Kong. Click here for the history of Central and take a look at the list of the most “famous” buildings that make it up. Exit at the MTR Central station. 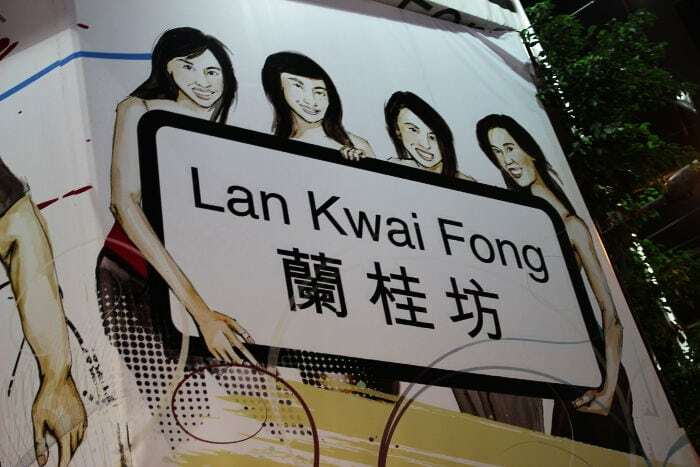 Lan Kwai Fong, better known as “LKF”, is the center of Hong Kong’s nightlife scene. This is a block where you’ll find more than a hundred establishments such as restaurants, bars, pubs and clubs. Click here for a complete list of retaurants and here for a complete list of bars and clubs di LKF. p.s. At the beginning of LKF there is, in my opinion, the busiest 7/11 on the planet. Take the D1 exit MTR Central station. The International Finance Centre (or IFC) Mall is the most famous shopping complex in Hong Kong. From the restaurants on the highest floor you can admire Victoria Harbor and the Kowloon peninsula. For the truly obsessed, here you’ll find one of the only two Apple Stores in Hong Kong (the other one is on Causeway Bay). The IFC Mall is located above the MTR Hong Kong Station (in Central). One of the two reasons why I love Hong Kong – the other being the elegant girls that shop at the malls in Central – is that it’s one of the few metropolises that I know of where you can “escape” to surround yourself in nature in less than an hour (and using only public transport). Try to do the same thing in Beijing or Paris and tell me how that turns out! 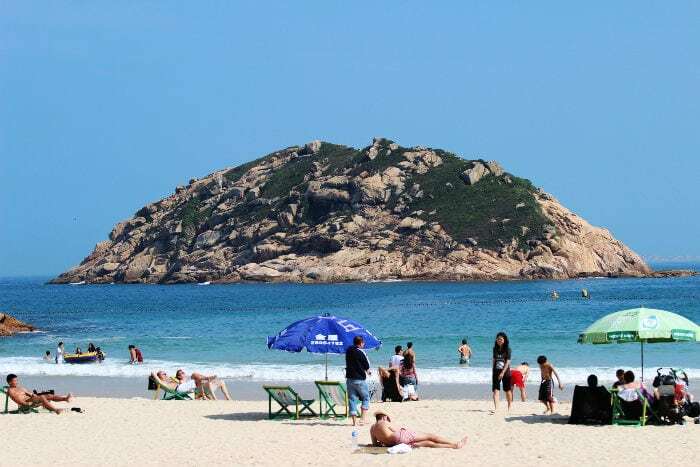 The village of Shek-O is located in the southeastern part of the island; it is here that you’ll find both Big Wave Bay Beach, one of the preferred destinations for surfers, as well as Shek-O Beach, which is more suited for families. Click here to discover the other beaches of Hong Kong. Take the metro to the MTR Shau Kei Wan Station, exit A3. Then take bus number 9 to Shek-O. The Hong Kong Ocean Park is, as the name would suggest, a theme park where you’ll find an aquarium, an amusement park and much more (click on the link for details). In 2013 it was the most visited theme park in all of Asia (and twelfth in the world). Take bus 629 from Central Pier number 7 or from the MTR Admiralty Station, Exit B.
SOHO, which means South Of Hollywood Road, is another area of bars and restaurants (located, like LKF, in the Central neighborhood). In my opinion, compared to LKF, it is more elegant and suited for those in search of a more relaxed atmosphere. Take the MTR to Central Station, Exit D2. Causeway Bay will always remain impressed in my mind because, the first time I came to Hong Kong, I popped out of the subway right at exit D of the Causeway Bay station (my hostel was right there, a few steps away) and a Double Decker Bus (yes, like those in London) almost ran me over. But let’s not waste time talking: Causeway Bay is the commercial center of the island: it is in fact an area swarming with luxury boutiques, small bargain stores, shopping malls and lighted panels. Take the metro to the MTR Causeway Bay Station. The Hong Kong Convention and Exhibition Centre is, together with the Asia World–Expo, one of the two most important exhibition centers of Hong Kong. Take the MTR Wan Chai Station, Exit C.
The Star Ferry is the boat that, since 1888, has connected the island of Hong Kong to Kowloon Peninsula, which is located just a few kilometers from Mainland China. 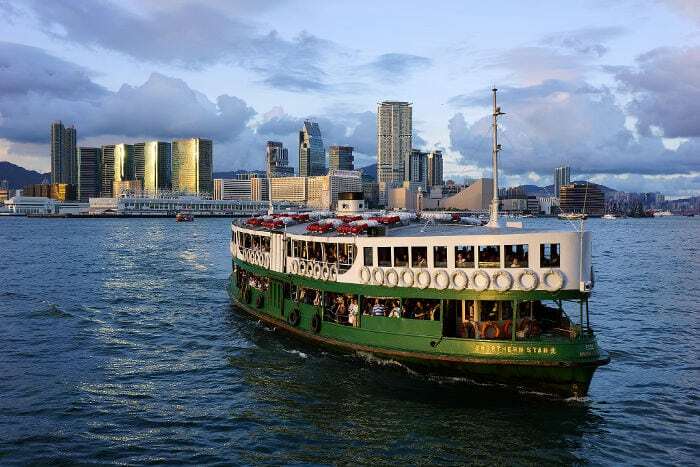 Despite the island’s now being connected by enormous well-lit tunnels and the subway, the Star Ferry is always the top draw, both among tourists and residents of Hong Kong who every day cross the channel that separates the island of Hong Kong from terra ferma. Central Star Ferry pier: MTR Hong Kong Station, Exit A2 or MTR Central Station, Exit A.
Tsim Sha Tsui Star Ferry pier: MTR Tsim Sha Tsui Station, Exit L6. Wan Chai Star Ferry pier: MTR Wan Chai Station, Exit A1. Even though my suggestion would be to stay at least one night in Macao so that you can visit it without rushing, considering that the first ferry leaves Hong Kong at 7 AM, the trip lasts only an hour and, moreover, you can return to Hong Kong even late at night, it is therefore possible to visit the ex-Portuguese colony in just one day. Click here to find timetables and pricing for the Turbojet ferries, the transport company I’d recommend for the Hong Kong – Macao trip. Get to the Hong Kong-Macau Ferry Terminal in Connaught Road Central, near to Sheung Wan MTR Station. The Tian Tan Buddha is a bronze statue of Buddha Amoghasiddhi that is located at Ngong Ping, on Lantau Island. To tell the truth, it never appealed to me. But I had already seen the biggest Buddha in the world (in Leshan), the Tibetan monasteries and the Thai temples of Ayutthaya and Bangkok. So it isn’t surprising that the Hong Kong Buddha didn’t impress me. If however this is your first trip to Asia and you’ve never visited a Buddhist temple, then I would recommend a visit! Take the ferry from pier 6 out of Central to Mui Wo and then bus number 2 to Ngong Ping. Or take the metro to the MTR Tung Chung Station and then bus number 23 to Ngong Ping. Froma Tung Chung it is also possible to take the cable car (5.7 Km, about 25 minutes). Tai-o, the last fishing village made of stilt houses, is one of my favorite places in Hong Kong. So much so, that I already published a photo gallery on the subject. Click on the link to discover why it deserves a visit! Take the MTR to Tung Chung Station and take bus number 11 to Tai-o. 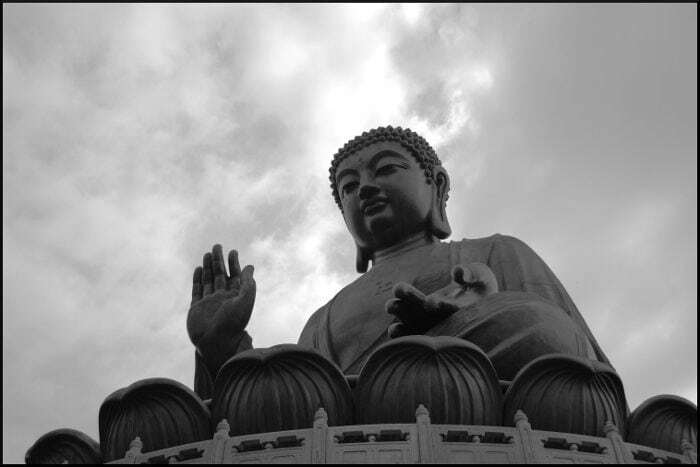 If you’d also like to visit the Tian Tan Buddha then take bus number 23 to Ngong Ping and then, after visiting the Buddha statue, number 21 to Tai-o. I admit I’ve never been to Hong Kong Disneyland (nor any other Disneyland). I recommend it to those that love that kind of stuff! Take the MTR to Sunny Bay Station then take the pink line to Disneyland Resort. 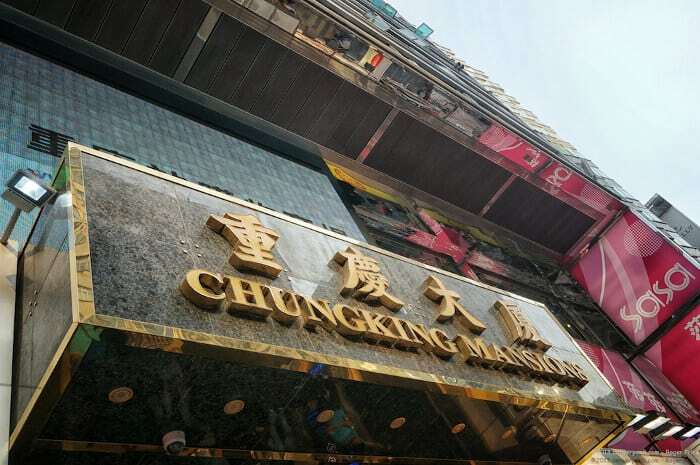 The Chung King Mansions are a strange place situated on Nathan Road, in the heart of Kowloon. There you’ll find about 80 hostels and shabby guesthouses, the most convenient – but also the most dishonest – currency exchangers in Hong Kong, various excellent Indian restaurants, vendors of all sorts, dealers, fake Rolex sellers, illegal immigrants and much more. Personally I’ve slept there many times and I’ve also reviewed some of my favorite hostels found in Mansions. Even if you’ll only be a few kilometers north of Central, you’ll feel light years away from the ICT Mall and its Apple Store. But this too is Hong Kong! Take the MTR to Tsim Sha Tsui Station, Exit C1. The Temple Street market takes its name from the Tin Hau temple, which is located right in the middle of the area where, every night, sellers of electronics, clothing, watches, (semi) precious stones and other junk gather while, just a few meters away, you can sit and taste tropical fruit, shellfish and other Cantonese dishes. Take the MTR to Yau Ma Tei Station, Exit C1, or the MTR to Jordan Station, Exit A. 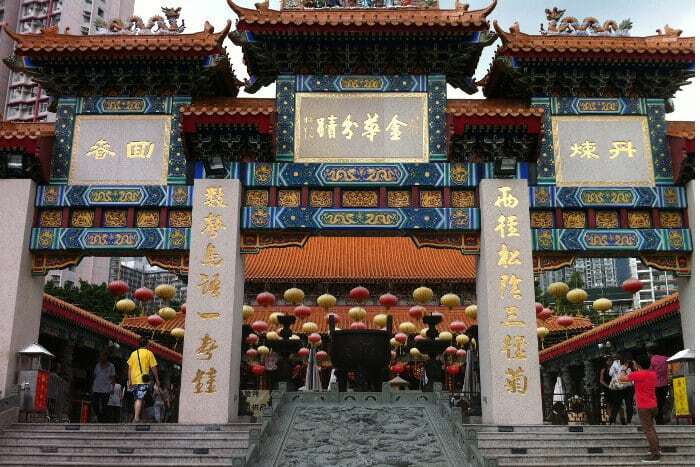 The Sik Sik Yuen Wong Tai Sin temple, dedicated to Wong Tai Sin, is the most visited Taoist temple in Hong Kong. Take the MTR to Wong Tai Si Station, Exit B2. The Ladies’ Market is located on Tung Choi Street, in Mong Kok, just a few steps from Nathan Road, the artery that crosses Kowloon from north to south. There you’ll mostly find women’s clothing (hence the name “Ladies’ Market”), but also watches, CD and various other accessories. Take the MTR to Mong Kok Station, Exit E2. Lamma Island is, by extension, the third island of the Hong Kong archipelago after Hong Kong Island and Lantau Island. 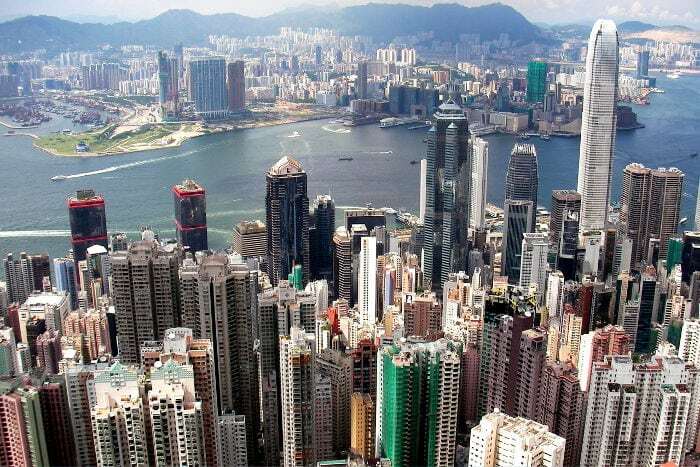 It is a relatively tranquil place that contrasts with the constant activity of Kowloon or Hong Kong Island. The noteworthy feature of Lamma Island is that there are no cars here: you can only get around on bicycle or on foot. Take the ferry from pier 4 in Central to Yung Shue Wan (the trip lasts about a half hour). [Photo Credits (Creative Commons License): Peak tram: www.flickr.com/photos/cwot/, Central from Hong Kong Peak: www.flickr.com/photos/imagezen/, Star ferry: www.flickr.com/photos/46990836@N03/, Tian Tan Buddha: www.flickr.com/photos/edwin11/, Chung King Mansions: www.flickr.com/photos/rwp-roger/, Sik Sik Yuen Wong Tai Sin: www.flickr.com/photos/tobiwei/, Lamma Island: www.flickr.com/photos/andyenero/].